Hello and thanks for stopping by my website. 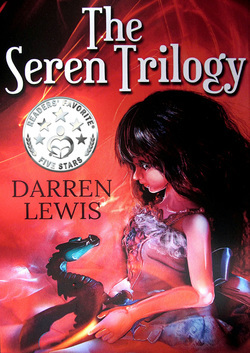 My name is Darren Lewis and I'm the author of The Seren Trilogy, ﻿Vengeance o﻿f﻿ Shadows﻿, The Oncoming Storm, Sacrifice of Angels, The Dragon's Tomb, Enemy of Darkness and I Think I've Lost my Bottom. These three books would be turned into The Seren Trilogy and the story of Ellie's adventures began. Vengeance of Shadows is the first book in The Baiulus Series. Baiulus is latin for 'bearer of a burden' and is set four years after the trilogy. The remaining books in the series are now available from Amazon. to see her wonderful array of work. The first book in the Trilogy, Ellie and the Rabbits is also getting a makeover. I have taken the story and composed a poem and this will be illustrated by yet another wonderful talent, Angela Park who runs Paperstory. Please take a moment to look at her website.